To sketch or not to sketch, that is the question. If I am going to paint a subject in watercolors, acrylics or oils I will definitely make sketches to find the best composition and then do a value sketch to get the darks and lights worked out before I enlarge the sketch and begin the painting. Sculpture however is a bit different. I will still do sketches for ideas and for note-taking and remembering facts and things to do a bit more research on, but the difference comes in the fact that what looks great in a single image view doesn’t always look great from the side or back. 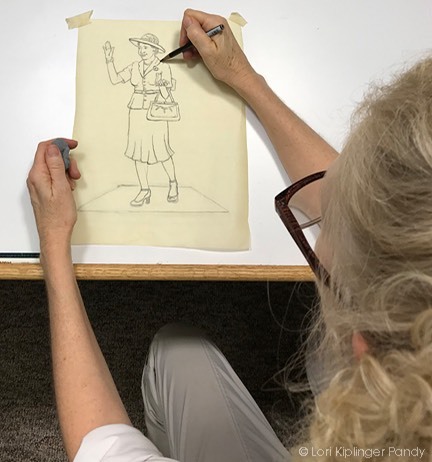 So while the sketch is still a really great place to start and helps other people involved in the sculpture ‘see’ where you are heading, the sketch is simply a prelude to the maquette. Only by building an armature, putting clay onto the forms and then turning the little maquette around to see all sides can you get a true idea of how well that initial sketch idea works in reality. There are many different ways to sketch. Some artists prefer sketch books that they can carry around everywhere and can keep their work organized in one location so they can flip a page and see the progression of work. I typically work on individual sheets of paper and on tracing paper — a personal preference. I find working in a book cumbersome due to the binding and my wrist chafing on the edges of the paper. Working on paper gives me a flat surface and with tracing paper I can overlay one drawing on top of another to refine work and ideas. Additionally I have an 11” x 14” Wacom drawing tablet that I often use with my Mac and Photoshop for drawing as it suits my original manner of working by layering tracing paper - Photoshop allows me to work in layers to tweak a drawing or idea. Based on the mind-maps that I created earlier I have narrowed down the ideas to two or three images. While Fannie Mae truly loved dressing to the nines, dancing and posing in her nightclub, enjoying the good life while looking good, first and foremost in my mind is Fannie Mae the businesswoman. For her opening night of the Cotton Club she set out to buy a wonderful dress for the occasion, falling in love with a gorgeous red evening gown. I’m sure that she looked stunning in it and it was a real temptation! But her practical and business side won out and instead she invested in a sensible black gown that she knew would always wear and look well but more importantly, would be something that she could work in as she was the woman running the club, not a spectator visiting and watching the floor show. 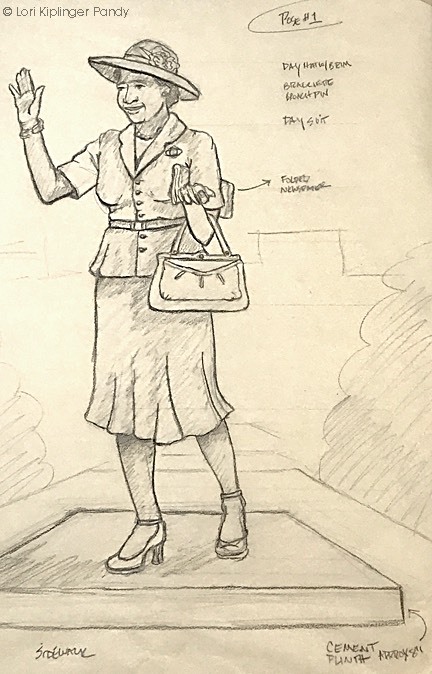 Choosing to show Fannie Mae in her day suit heading to work gives a feeling of her energy and accomplishments much more than if she were wearing evening attire. In this sketch I have approximated an 8” cement plinth to raise her off the sidewalk a bit and give her a sense of place. She is carrying a purse as if walking up to the front door ready to open up for business, with a folded Colorado Springs Gazette under her arm. 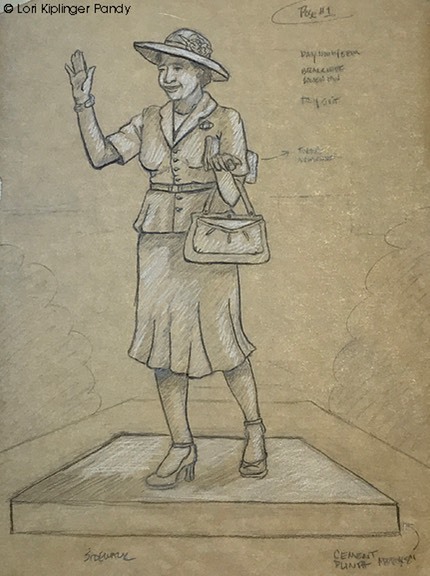 She’s wearing a brimmed hat and waiving in a welcoming manner to greet visitors that would be welcoming to visitors of the Pikes Peak Center for the Performing Arts.